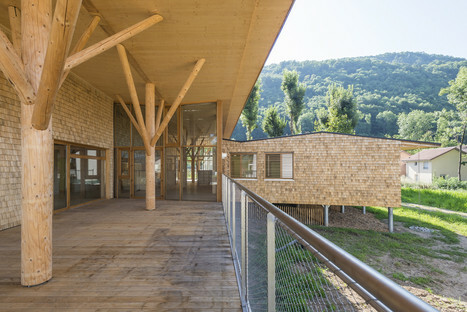 The new Relais d'Assistance Maternelle for 40 children by R2k Architectes is located in a woody area on the outskirts of Tencin, a tiny village in Eastern France. 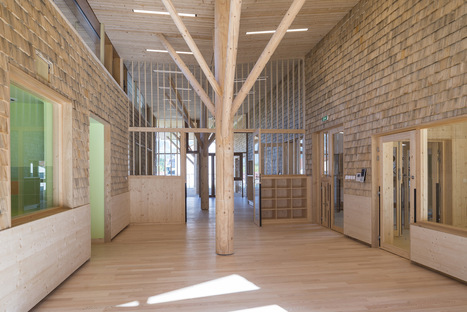 Inspired by French mountain building traditions, Véronique Klimine and Olavi Koponen of R2k Architectes presented the town of Tencin with a design in which the facades of the new nursery building are completely covered by wooden shingles. 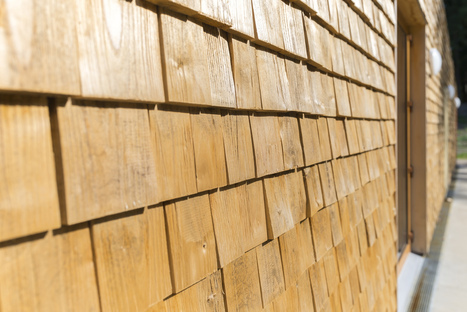 Local spruce or chestnut wood was used to create the so-called ‘tavaillons’, which still characterise many buildings today and function as insulation. It is a kind of trademark for architect Olavi Koponen, whose architectural output has often employed this kind of covering, used in various projects for homes in Northern Europe, where interior insulation was very important. The link with the site on which the nursery is located is created by colour association with the landscape. The terrain has recently been split into lots for development, but is still largely green belt, and the nursery is situated at the crossroads between the Route d’Hurtières to the North and L'allée du Roy to the West. A horticultural area extends to the North along the wall running along the Route d’Hurtières, in two recently created lots, one to the East and one to the West, making up the volume and proximity reference points of the nursery. 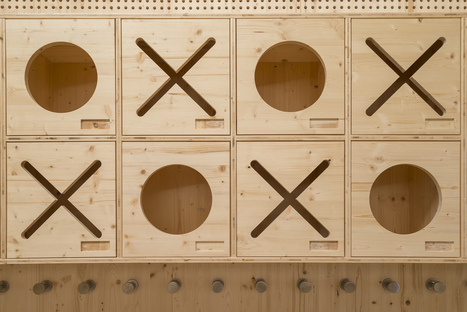 The R2k studio has taken on the pale, earthy colours of the wood, which can also been seen on the roofs and walls of nearby homes, while designing a building that stands out from its urban setting, made up of collective housing or detached and terraced homes with gabled roofs, and has preferred to lower the maximum height of the building below the average heights of nearby lots. 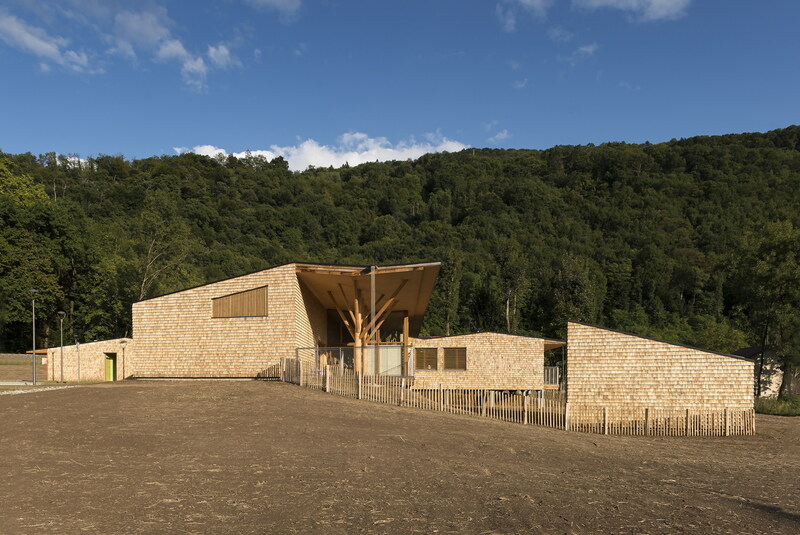 Together with the choice of wooden shingles, it suggests that the project is trying to achieve a figurative unity with the landscape, to the extent of avoiding occupying the land, with its grassy garden roof. 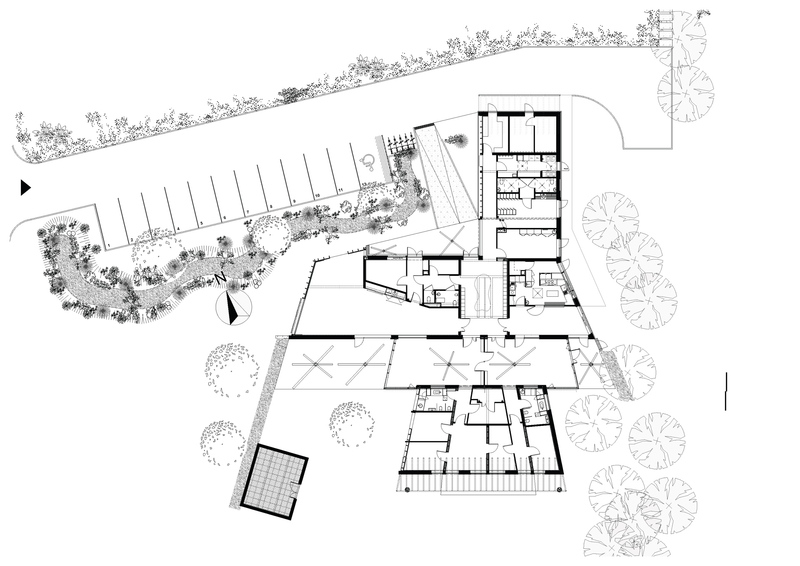 The structure is a one-floor building and extends along a North-South axis, starting with a portico leading to a corridor that makes up the reception area, through spaces for children’s activity, and finishing with a second glass portico, facing South-West. 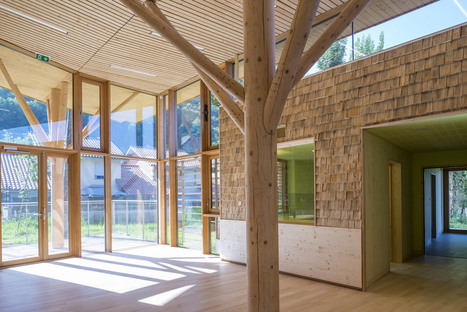 Its composition looks like two distinct homes have been joined and converge at the South portico, a place where children can meet, interact and contemplate the surrounding nature. 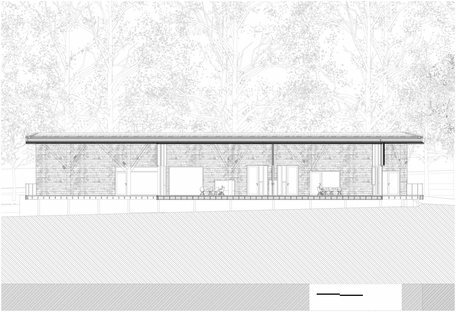 Structurally, the nursery is built on land that slopes down to the South, so that while the North wing rests on terrain with a concrete floor, the South wing floats on slim metal pillars and overlooks the green land opposite. The two parts are joined by a concrete wall. 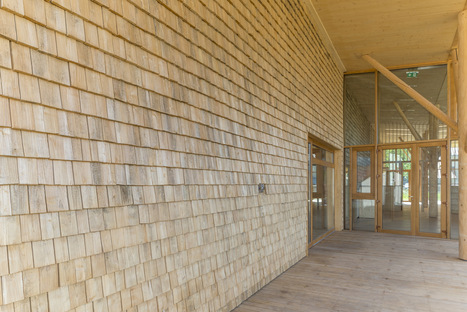 The shingle covering also underlines the presence of these two large volumes, which make up the activity and play spaces, in contrast with the space for napping and relaxation. 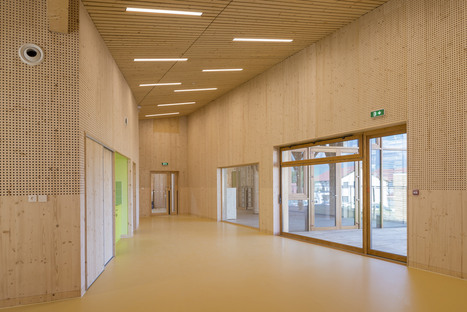 An interesting contrast between the exterior and interior has been deliberately created by the supports in the shape of trees that help stabilise the CLT roof and its solid wood panels. The architects say that they were inspired by the fascinating Crosby Arboretum by Fay Jones, in Mississippi. 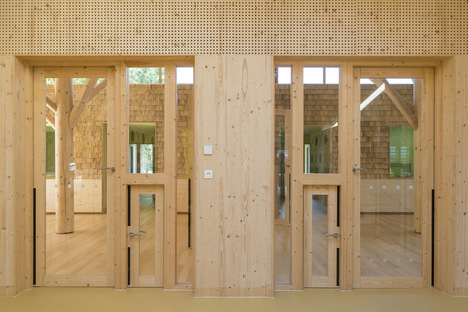 This space is definitely the heart of the building and a great deal of importance has been given to the visual and perceptive relationship with, as well as the proximity to, nature in this nursery. 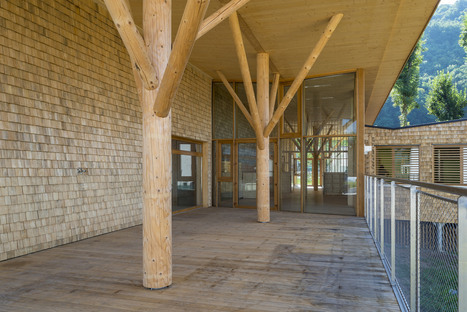 A boundary and a place of transit from outdoors to indoors, the glass portico marks the passing of time, the seasons and activities for its little guests and their teachers.